Godwin’s Law states that the longer an Internet discussion continues, the probability of a comparison to Hitler grows. The consequence of Godwin’s Law of Nazi Analogies is that, the second the comparison is made, the argument is deemed to have been lost. Hitler didn’t start off with concentration camps. He started off by discrediting the media. Who’s discrediting the media now? President Trump. His next step was to silence scientists and government employees. Who is silencing scientists and government employees? President Trump. Hate crimes against minorities grew to the highest in their country’s history. Clashes between parties became so extensive that Hitler ended civil liberties, giving “law and order” as the cause. 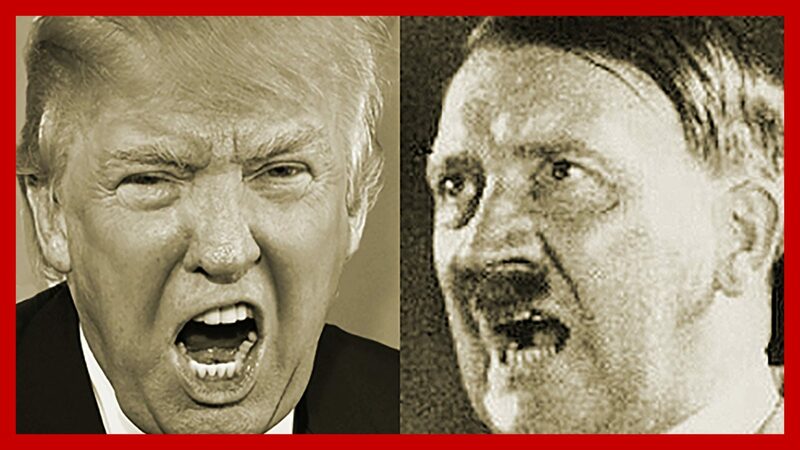 Those who opposed Hitler were ridiculed and threatened. Are we seeing hate crimes grow under President Trump? Are we seeing clashes between parties under President Trump? Are we seeing the end of civil liberties in the name of law and order under President Trump? You tell me. These are the next steps under Hitler that have not happened yet under President Trump. Wealthy supporters purchased media outlets, employing only those faithful to the ruling party. We have only seen part of this under President Trump, with his employing of Leninist Steve Bannon, and of course the undying patronage of campaign supporter Rupert Murdoch and Murdoch’s Fox News. In his final step, Hitler declared that the only way the country could be unified was to restore traditional values. Minorities including gays, the disabled, Jews, Roma and people of color were considered “inferior” and sent to death camps for slaughter. While Trump has indicated he wants to restore those traditional values by making America Great Again, he hasn’t sent anyone off to camps yet. This is how “regular” German citizens ended up supporting Hitler and the parallels are too great between those people and Trump supporters. Trump once declared his support was so great that he could shoot someone walking down 5th Avenue and not lose any supporters. I hope he’s wrong and people who support him will fight back against what’s happening. If they don’t, they are no different than regular Germans during Hitler’s ascension. Although web sites we backlink to beneath are considerably not related to ours, we really feel they are truly really worth a go by, so possess a look. Pretty! This has been a actually superb article. Many thanks for delivering this data. Hey there! I not too long ago saw your website and I undoubtedly appreciate it. I love to communicate about omega xl from time to time. Great to be close to, thanks a whole lot! Many thanks yet again for the website put up.Genuinely thank you! Fantastic. One was produced only for demonstrating seconds and small whilst a different one particular making use of minute graduations is made for implying hours. Hey there! I not too long ago observed your site and I definitely get pleasure from it. I love to speak about omega xl from time to time. Great to be about, many thanks a good deal! One was developed only for displaying seconds and tiny while a diverse 1 making use of minute graduations is produced for implying several hours. Thank you for some other great report. The place else may just anyone get that variety of info in this sort of an excellent implies of creating? I’ve a presentation subsequent week, and I am on the search for this kind of details. Do you have a spam issue on this weblog I also am a blogger, and I was curious about your scenario a lot of of us have created some wonderful practices and we are hunting to trade techniques with other folks, why not shoot me an e-mail if fascinated. Hey there! I lately noticed your site and I certainly appreciate it. I adore to communicate about omega xl occasionally. Very good to be close to, thanks a lot! Do you have a spam issue on this blog I also am a blogger, and I was curious about your scenario numerous of us have created some nice methods and we are looking to trade techniques with other folks, why not shoot me an e-mail if intrigued.